Directions: Remove chicken from fridge 30-45 minutes before you plan to start cooking, so that it reaches room temperature before adding them to the pan, to ensure even cooking. (This will take about 15-30 minutes.) Set aside. Place lemon slices on an aluminium-foil covered tray (for easy cleanup), in a single layer, spacing them evenly apart. With a pastry brush, lightly coat lemon slices on both sides with 1 Tbsp. olive oil & season with salt & pepper. Roast them for 20-25 minutes in a 400°F preheated oven, or until the lemon slices begin to brown around the edges. Flip over slices half way through cooking (at about the 10 minute mark), so that they cook evenly on both sides. Meanwhile, steam spinach: In a medium-sized sauce pot, bring 1 c. water to a rolling boil, add spinach, cover with a lid, & steam until gently wilted (spinach should still retain its bright green color), about 2-3 minutes on high heat. Remove from heat & then let cool for a few minutes. Then drain & squeeze out excess liquid by cupping your hands together, with the spinach in the center, & press. (This method is honestly much more effective than using a colander or a sieve. You can extract a lot more moisture this way.) Place drained spinach into a small bowl & set aside. Next, place rinsed, defatted chicken breasts onto a clean, non-porous surface, & cut into 2" wide strips. Cover with plastic wrap & tenderize, pounding with the bumpy, textured end of a meat mallet until 1/8" thick. Discard plastic wrap & set aside. Place breadcrumbs & all fresh herbs into a medium-sized bowl & thoroughly combine. Dip each piece of chicken into the bowl, thoroughly coating both sides. Shake off excess & lay onto a plate. Repeat this process until all chicken pieces have been breaded. Set aside. Sauté onion, garlic & bay leaf in olive oil in a large (12-13") sauté pan on low heat until tender, about 5 minutes. Stir occasionally. Deglaze with white wine & then with 1/4 c. chicken broth a few minutes later (after the wine cooks down a bit), reducing liquid until there's only a thin layer on the bottom of the pan before adding chicken. Transfer breaded chicken pieces from the plate into the pan, spacing pieces far enough apart so as not to crowd the pan. Cook chicken for about 2-3 minutes per side, or until chicken is no longer pink, its juices run clear, & its breaded exterior has turned golden brown on both sides. While chicken is cooking, add the remaining chicken broth, a 1/4 c. at a time, to prevent chicken from burning or sticking to the bottom of the pan, allowing each addition to be fully absorbed before adding the next. Watch the pan carefully as tenderized chicken doesn't take very long to cook through & brown. 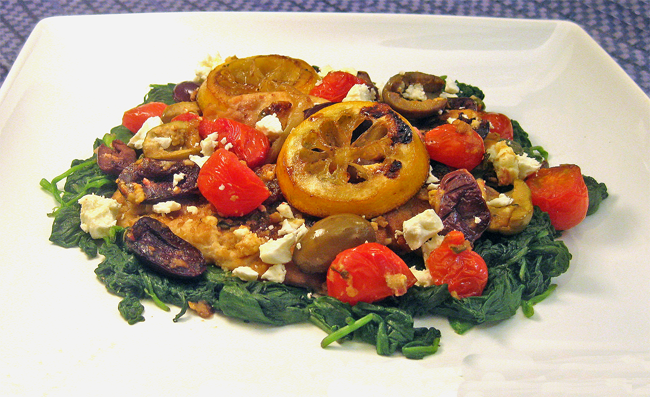 After you've flipped the chicken over to cook on the other side, add the olives, feta, tomatoes, capers, & roasted lemons to the pan & continue to cook for the remaining 2-3 minutes. Feta should melt a bit. When ready, remove from heat & discard bay leaf. Divide into equal portions. Transfer to plates, & garnish with additional feta & parsley, if desired. Serve immediately, with couscous, orzo, or rice.